What Can You Clean With Blue Clean AR390SS? The Annovi Reverberi (AR) Company is a world-famous Italian brand that has been manufacturing pressure pumps and pressure washers for the past 60 years. They wouldn’t be that long on the market if they don’t know what they are doing, and the good reputation precedes them. One of their best-selling units is the AR390SS model, and rightfully so. We have prepared a thorough test for our Blue Clean AR390SS review. We will cover all important information, model specifications, provided additional equipment, cleaning capabilities and general warranty policies. With our in-depth review, you can easily see whether this is the right choice for your cleaning needs. 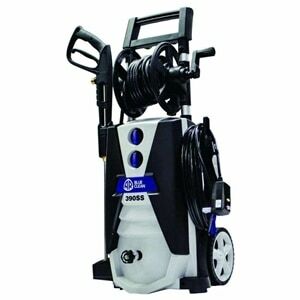 The AR390SS pressure washer is advertised as a unit that can tackle medium to heavy-duty cleaning tasks. When we tested it, it proved very powerful indeed, however, we still feel like it’s best used for medium-duty cleaning. The tougher stains were indeed conquered, but not with ease. This unit is powered by a universal 120V 60Hz motor, which is able to produce a force of maximum 2000 PSI at 1.4 GPM. This makes up a total cleaning power of solid 2,800. Italians are known for their design, and Annovi Reverberi washer is beautifully packed into a powerful and compact unit. The ease of use is phenomenal – you can have the pressure washer running in under 3 minutes. All you have to do is plug the water inlet, insert the high-pressure hose into the unit, and connect the trigger gun. It’s important to say that this pressure washer is environmentally friendly – manufacturer claims that this model consumes 80% less water and is 45% more powerful than a standard garden hose. When you buy the AR390SS pressure washer, you get everything you need for successful cleaning. The additional equipment includes 30-foot high-pressure hose, an integrated 48 oz detergent tank and quick connect garden hose adaptor. There are 4 different nozzles that are best suited for a variety of tasks. Read the manual to use the correct nozzle on the required surface for the best cleaning results. With AR390SS, you get a 25-degree nozzle tip, 0 degrees, rotary/Turbo nozzle, and low-pressure soap dispenser nozzle. The AR Blue Clean company has one of the best customer service policies on the market. They even won an award for Best in Class customer service, and rightfully so. First, they maintain excellent response rates and value customers through and through. They are available for all inquiries 24/7, and consumers appreciate this. When it comes to warranty policies, they provide a 1-year `bumper-to-bumper` guarantee. After you complete the purchase, make sure that you register the product on their website so that you can get the best support needed. US-based customer support is handled through phone or email. This pressure washer belongs to the medium-duty washer group, meaning that it`s great for cleaning a wide variety of surfaces. You can easily get rid of seasonal build-ups like pine cones, needles, and overall muck. You can also remove the dust, dirt, mud, grime, and moss. When we are talking about the surfaces which you can cover with this pressure washer, this unit excels at cleaning patio furniture, lawn mowers and other heavy machinery, cars, bicycles, stairs, windows, decks, even sidings. This famous pressure washer unit isn’t light-weight like other electric power washers on the market, but it has durable wheels and it’s not that hard to move it around. The Total Stop System is really useful, saves water, and prolongs the pump life. The warranty that comes with this unit, and the customer support, is excellent. It’s always good to be covered, just in case. Even though this isn’t the smallest of units, it’s tightly packed for a greater convenience – there is a hose reel, professional lance with the holster, and an onboard tank. The lance is made from zinc steel, and there are a lot of plastic parts that could have been better manufactured, or at least with more durable material. However, far from it that this pressure washer breaks down easily. If you need an industrial-duty pressure washer for the tough stains that you plan on using in commercial applications, this isn’t the right unit. And it definitely costs way less than an industrial grade cleaner. However, this compact pressure washer has everything you need for medium-duty cleaning jobs. You can even tackle the harder stains, but those would take more time and energy (but it is possible). The ratio between power and price is more than excellent. If you are looking to get a versatile pressure washer for residential tasks, this is a good choice given the warranty and pressure output. Other units on the market with similar possibilities and quality design cost almost double. We have tested this unit and brought our conclusions to the Blue Clean AR390SS review so you can make an informed decision – knowing all the good and the bad that comes with it. There are more powerful units out there, but this is still a good purchase. Let’s not forget that this is a highly rated unit by the Top rated Consumer Report in 2016 for electric pressure washer tests.